Everyone knows that you can "do" 3D in AutoCAD. AutoCAD 2007 made 3D operations, well, feasible in AutoCAD. Before 2007, it was difficult to make simple 3D objects. Many never tried. After AutoCAD 2007 many were impressed and satisfied with it's 3D abilities. Once I started using 3D in AutoCAD the number one response I would hear was, yeah, that's good, but AutoCAD can't do organic modeling. True. If you needed sharp corners, then it was perfect. Well, now AutoCAD 2010 has provided us with that ability. Once the new free form modeling features hit the design houses and its users can see what it can do now, I wonder what the next complaint will be? Any ideas? I'm going to get more into what AutoCAD 2010 free form modeling can do later on, but now I just wanted to share with you an image made from AutoCAD 2010. This model was created by Guilermo Melantoni, one of Autodesk's AutoCAD Product Managers and the guy in charge of the 3D improvements. Look at the image. I would never have guessed that it was crated in AutoCAD. Would you? I can't wait until I get that good at modeling. Besides the 3D enhancements, the 2D addition of parametrics is the other big addition to the software. If you "don't do" 3D there is still something in the update for you. Parametrics have been in CAD programs for a long time, but not in AutoCAD. It's about time. I love parametrics and the constraints in AutoCAD 2010. I'm a little biased though. I helped Autodesk create some of the new parametricly constrained dynamic blocks and sample files that will be coming with AutoCAD 2010. I will be showing these features off later. It's been a rough time for CAD related print magazines. Cadalyst magazine was dropped by Questex Media then picked up and licensed by Longitude Media (see my post discussing this.) AUGI and Solidvapor parted ways effectively halting the publishing of AUGI World. Great news, AUGI World Jan/Feb 2009 was just issued! But, in digital form only. Sound familiar? Cadalyst is doing the same, for now. Being a writer for both entities I have been aware of these awful situations. Thousands of readers go to both magazines to glean information, tips, and trends on a daily basis. Follow the link and download a copy of the magazine. AUGI World is a great find. There is so much information in it covering many different fields and topics that anyone can get something out of it. And it's free!! WOW!! Thank you Ellen for making CAD-a-Blog your newsletter's Resource of the Month for March. Ellen Finkelstein is the author of the book, AutoCAD 2009 and AutoCAD LT 2009 Bible. It is one of the best, and most exhaustive books about AutoCAD. It has everything in it plus examples and ways to apply the tips Ellen teaches you. I have been helping Ellen update her book to AutoCAD 2010. What a project! Rest assured that Ellen knows AutoCAD. She has been writing and updating this book since AutoCAD release 14! What a project! When Autodesk started with their yearly release, Ellen's work increased! If you haven't visited Ellen's website, I suggest you do. She is also a writer of several books discussing Microsoft's Power Point. She is a real wizard with this application too! Ellen has a newsletter that goes out via e-mail. I am a member and I suggest you become one too. Just go to her website and sign up. It's free! When did being a geek become cool? Steve Johnson at CAD Nausem, posted yesterday, or today in Australian time, giving us a little video that he compiled from a series of short interviews of the bloggers and Autodeskers that were at the AutoCAD 2010 Launch Event. It's a fun video and I loved it. I'm in the video, so of course I loved it. If you aren't a geek, or a CAD Geek, then you might not find it as funny and entertaining as I did, but that's ok.
As I was watching my fellow bloggers in this video, and even recently, I wondered (as it says on the headline) "When did being a geek become cool?" When I was a kid, way back before the internet (all we had were 400 baud models going to message boards), being computer savy, or just tech savy was taboo. Now, everyone is tech savy. Well, not everyone, but it is more mainstream. Fewer and fewer people have cell phones. Smart phones are becoming more and more mainstream. They are no longer a sign of upper echelon management personnel, but they are an every day site, on the average person. Try to buy a "cell phone" and you hard pressed. I just want a phone, no camera, no spreadsheet, no facebook link, etc. I said that recently because we were looking to get a "regular" cell phone for our pre-teen. Found one, but it was difficult. Now my 8 year old wants a blackberry!! Scary thing is she's smart and savy enough to use it. Back on topic, sorry. When did having your own blog become acceptable? When I made my first website, or home page as they were often called (though I never liked that term), people asked me "Why?" Valid question. I only did it because I could. That's a geek, making a website, something accessible to the entire world with no concern if anyone ever sees it, simply because we can. "They" called me a geek. I've always been a geek. I was a geek when being a geek wasn't cool. Now you see geeks everywhere. The smart, nerdy, geeky archetypes have always existed in pop culture, TV, comics, movies, everywhere. But now, mainstream characters are geekish. How many TV shows are there who's main character is a geek? Or at least have prominent characters that are members of the geek race? To many. There are even sows out there that depend on a geek type audience. People that aren't geeky by nature won't get most of the references in the weekly dialog. For example, the TV show Big Bang Theory. I love it. Not because it's a ground breaking program, but because of all o f the obscure, and not so obscure, geek related references. When my wife and I watch that show, we find that I am laughing non stop, while she is wondering why? No, not why did she marry a geek! But why am I laughing. Then I have to explain to her the reference, and well, she still doesn't laugh, but is glad that I am having a good time. My wife married a geek once. Yup, that was me. She knows it. She did it on purpose. She told me once that her aunt told her to marry a geek. She said to do this because you know they are intelligent, (um, duh?) loyal, and have no way of getting a girlfriend to cheat with! Or something like that. It's true though. Between my wife, my kids, my blog and my dog I have no time for a girlfriend! If you watched Steve's video, did you notice the reactions the people gave when he asked us if we were geeks? Many replied in a positive fashion, while others reluctantly admitted guilt. Some were embarrassed, though I feel most were faining embarrassment, while others embraced their state of geekiness. When Steve asked me that question all I gave was a very strong and convincing "YES." I didn't feel the need to explain it, or justify it. Yes I am a geek. I have always been a geek and I will always be a geek. I know it, you know it, my family knows it and the entire world knows it. What I don't like is when people jump on the Geek Bandwagon in an effort to look cool. I mean, how ridiculous is that? Using your blackberry or myspace page to "prove" you are a geek is absurd. Can you hack that crackberry? Did you write code for your page? Can you even spell HTML, RSS Feed? Being a true geek today is being a geek on a whole different level. It's not just playing with Star Wars toys, or knowing how many tribbles fell on Kirk, it's knowing these things and loving them. It's being able to do things with mainstream tech that the average user can't. It's about getting excited about a new release, or a hotfix, or, well, you get the idea. Geeks are passionate people, just like jocks, or politicians. They love what they love because to them it is fantastic. They aren't bad, they aren't good, they just are. They enjoy life and the things in them. They are becoming more mainstream and its about time that society embraces their way of life. What do you call a group of nerds? Or geeks? I know many of you, just as I have, have been reading Cadalyst Magazine for most of its 26 year history. It started off as a user group of sorts but came to be much more. This past month, Questex Media Group, Inc. announced that they would no longer publish Cadalyst. Questex has owned Cadalyst for several years. They quickly let go several key staff members and kept a skeleton crew to finish out the month of February. That has changed, to some degree. Longitude Media, led by former Questex Media vice-president, has agreed to publish Cadalyst through a licensing agreement with Questex. Nancy Johnson, editor in Chief of Cadalyst will remain in this position. It also seems that most (if not all) of the contributing authors will stay on creating their high quality articles and tips as always. Longitude Media will be able to continue with the online side of Cadalyst with little or no stop in production. However, the print side of things is up in the air for now, but I am told that they will eventually print again once it is feasible. I am very excited about this announcement as I am on of the contributors to Cadalyst. I review the tips submitted to Cadalyst by its readers for the Tips and Tricks Weekly newsletter that comes out every Monday. Last week I thought I had reviewed my last tip, but today, after this blog post, I have to get back in the saddle and get these tips reviewed before tomorrow so we can catch up! Hurry for Cadalyst and for its readers. I can't wait to see what this change will bring! Thanks for sharing with us Shaan. While I was at Autodesk’s office in San Francisco, I was fortunate enough to have been given a tour of many of Autodesk’s Labs projects. John Schmier, Autodesk Labs Engineer and Evangelist, was very happy to show off several of the Labs Projects. In this tour there were many examples of 3D printing. The ability to send a file to a 3D printer right out of AutoCAD was added to AutoCAD 2010. It processes and sends your model to a 3D printing service. You will receive your model in the mail after a few days time! With the cost of 3D printers around $30,000 apiece (that price various greatly depending on what it does, etc. ), it can very difficult for firms to have this ability in house. Here are some photos of what Autodesk had on display. If you went to Autodesk University 2008 you will probably recognize the motorcycle in the photos. Every part was created via 3D printing technology. Many of you might recognize the Touch Screen from AU. It is a giant screen that has touch interface. Depending on which program you are running, you can use a certain amount of touch points to manipulate your files. This display had touch enabled version of Autodesk Design Review and Autodesk Mudbox. Using different combinations of touch points and movement you can navigate through a DWG file or you could render a 3D object in Mudbox. Autodesk is studying ways humans can interface with computers. The software is there, but making it so it can run on different hardware is evidently the issue. Windows 7 is supposed to support touch technology, so we should be seeing more and more hardware and software available with touch interface technology. HP also has hardware out that can handle up to four touch points, but Autodesk’s software has been developed to work with eight to ten. The software and the hardware are still in need of coming together before this technology type becomes more mainstream. One of the other pieces of technology highlighted in my tour featured other ways of interfacing with the computer. Autodesk is looking for more ways to take everyday hardware that is relatively inexpensive and apply it to new ways for humans to interface with computers. In this example, Autodesk took a remote control from a Nintendo Wii (download the driver here) and was navigating through a Design Review file. Another device was nothing more than a cardboard cube. A basic web cam was looking at the device and could recognize which side was up! It was using a form of Augmented Reality. To turn the drawing object on the computer screen so that the back was displayed, rotate the cube in your hand until the back was showing. It works just like the View Cube in AutoCAD and Design Review, but it is a physical object that a person can hold in his or her hands. It can make presenting a drawing more simple for those that are not as familiar with the display controls inside Autodesk products. Using a simple web cam, the Labs had a display that can easily be applied to spatial planning. This was also using Augmented Reality (click the link to see a YouTube video of this tech being demonstrated.) There was a computer, large screen and a web cam that was viewing a flat display on a table in front of the screen. The display was flat and had tiles on it. Each tile had a picture of a building, parking layout, or other equipment or buildings. The tiles on the display mat were read by the web cam and recognized to represent 3D models on the screen. The software running could then analyze the data shown and conduct process like light studies or airflow around the buildings. This tool is meant to aid spatial planners of all sorts to be able to look at objects and see how they interact with each other. City Planners and warehouse designers could quickly throw down some tiles and see where they can fit, how they affect the surrounding area, and more. The last bit of technology shown that I want to talk about was the Boom Chameleon. The Labs department has been displaying this bit of tech for some time now and I was glad to get a chance to see it in person. There are many different applications that can take advantage of this device. The Boom Chameleon demonstrates how car manufacturers can save millions of dollars working on prototypes for new car designs. The Boom on display takes a 3D model of a car (in this case, but it could be anything) and allows the user to walk around it, inspecting it in real time and size. The device consists of a platform with a tower and boom. There is a screen at the end of the boom that can be lifted, lowered, and spun to simulate a person looking at a real car. Where you move the boom and screen will determine where you are looking. It replicates a physical car. Evidently it take about a million dollars for a car company to create a full scale model of a new car. With the technology of the Boom Chameleon, they no longer have to create as many real models. They can conduct inspections of the new design and get a good feel of how the car will look before it exists. It is estimated that this technology could reduce the amount of models created by 50%. This technology can also be applied to building inspections and constructions. Using the Chameleon and BIM, users can take the boom out to an existing building, move it around a room and "see" what is inside the walls, floor and ceiling before they start punching holes and destroying whats inside. Very useful, as long as the data is correct! There was a lot of exciting technology on display by Autodesk Labs at the San Francisco office and I greatly appreciated John’s tour. If you haven't, visit Autodesk Labs and Scott Sheppard's Blog. You may be surprised by what they have available. Oh, and here is a link from Scott's blog about the event I attended. AutoCAD 2010 has several new features in it as well as enhancements to old features. I would like to present a “quick” list of some of the new features. • Conversion of polyface mesh coming from 3ds max and Image Modeler into solids (via converting them into a level 0 SubD mesh first). • AUGI Wishlist #5 : Rotating a Viewport Rotates the View in the Viewport - The ability to rotate a rectangular or non-rectangular viewport and have the view of the objects rotate with the viewport. • Users can sub select the segments of Polylines during 2D editing commands such as move, rotate etc. • Introduce a new protocol extension that refedit checkin() can use to determine if a particular object type should get the swapid processing. • The dimension object will support dimension less than 1m with the prefix of “0.” Or “.”. And more. There are so many new features and improvements that I can’t cover them all in one post, but I plan on covering them all, eventually. Which one of these features do you like the sound of best? I borrowed this list from Shaan Hurley's blog, Between the Lines. I was invited to Autodesk’s office in San Francisco on February 5th to be present at their unveiling and live webcast of AutoCAD 2010. I was invited for three reasons; I was/am a member of the beta team that tested AutoCAD 2010, I have a blog that discussed AutoCAD, and I created new dynamic blocks, templates and sample files for AutoCAD 2010. Now that I have patted myself on the back, let’s talk about some of the items and topics that were discussed at this event. One question I had going into this event was the future of AutoCAD? Would it eventually be orphaned, falling prey to the verticals? Or would it remain a staple product for Autodesk? How did Autodesk look at it? Was it too old to make better? What does the future hold for AutoCAD? Most of these questions were answered for me by Eric Stover, AutoCAD Product Line Manager. He is in charge of AutoCAD. He had his main team there and they too answered many of my questions and concerns. They are; Kathy O’connell, Guilermo Melantoni, and Diane Li. These three individuals are the AutoCAD Product Managers. They are the eyes and ears for the AutoCAD product. Together, through their presentations, taking our questions, and through asking us questions I came to the conclusion that AutoCAD is here to stay. Autodesk sees AutoCAD as their main product with all other products stemming from it and pointing back to it. I was glad to hear that. They want to fit the needs of every user and they feel that AutoCAD can fit a wider range of needs than any one vertical can. The verticals (Inventor, Revit, Civil3D, etc.) serve specific purposes, where as AutoCAD can fit the needs of all of these and more. There are so many uses for AutoCAD that they can’t possibly make a vertical for every field of use, so they want to make AutoCAD as diverse as possible. They also want to make it a stepping stone to more industry specific verticals. The two main features added to AutoCAD 2010 reflect this philosophy and was one of the major reasons it was decided to be put them in. Those two features are Geometric Constraints and Free Form Modeling. They are fantastic. Once you use them you will love them too. I do. Parametric and Geometric Constraints are nothing new to CAD, but they are new to AutoCAD. Inventor has had these for years. Adding them to AutoCAD will give more power to its users and make a transition to Inventor a little but easier. At the event, Lynn Allen (AutoCAD and Inventor Evangelist for Autodesk) said that she took an inventor example project and tried to do it with the new constraints in AutoCAD. She said she was able to get quite far, though admittedly Inventor does this type of thing better than AutoCAD. These new constraints will give a little bit of Inventor Power to AutoCAD users. The Free-form Modeling that is now in AutoCAD came straight from Maya, mostly. The programming Architects told me that they took that code, and made it work for AutoCAD. Great! I have recently begun modeling in AutoCAD so I understand the frustrations that users have in its limitations. Now with free-form modeling, users can create organic styled models. AutoCAD can create solids, surfaces, and mesh objects now! There are several new gizmos and enhanced gizmos that allow users to smooth a surface, crease it, turn it into a mesh and into a solid object for documentation. Great enhancement. Eric Stover said that these two main features are stepping stones for other products, but yet give enough power to AutoCAD users to do even more. They (Autodesk) want AutoCAD to fit the needs of everyone they can, but also want to make products that fit specific industry needs. They see AutoCAD as a bridge up and a bridge down to the other software. Users can start in AutoCAD and move those files up to a vertical. They also want their users to take the vertical and go back to AutoCAD with their data. That process is not perfected yet, but is a major goal they want to achieve. They also see AutoCAD as the “Front End Ideation Tool.” They see AutoCAD as a starting point for ideas, concepts, and derivations. The verticals are to do more industry specific projects in a more precise manner that is appropriate. AutoCAD can’t do everything perfectly, but they want it to do many (if not most) things well. In a nutshell, Autodesk seems to want to keep AutoCAD around for a long time and use it to fill the needs the verticals can’t. This is good, because many users are still using AutoCAD and don’t have the means or need to transfer to a vertical. If you are worried about becoming obsolete because all you know is AutoCAD, don’t worry it’s here to stay. But, according to Autodesk, it will eventually be only one tool in a vast supply of design tools available. I recommend you stay on top of AutoCAD, but also learn one of the other verticals because in the future we won’t be using just AutoCAD, or just Inventor, but will be using them both and more to get our work done. It’s that time of year again when Autodesk starts to unleash upon us its latest versions of AutoCAD and other products. There are several new features in AutoCAD 2010. The main three features that Autodesk is strongly promoting are: Freeform Modeling, Parametrics, and PDF Support. That being said, there are so many more enhancements and additions that without the above mentioned new features, AutoCAD 2010 would have much to offer. The two biggest updates are the Free-Form Modeling and the Parametrics. They will therefore require the most scrutiny and discussion. I will cover them right after I discuss the User Interface changes. Don’t worry; the UI is not new, just better. When you start AutoCAD for the first time there will be an extra step. That step is called the Initial Setup. The Initial Setup is essentially a workspace wizard that you can use to set your interface environment to your specific industry. It will also allow you to pick certain workspace and drawing templates. This process will create a new and unique workspace for you to work in called Initial Setup. You can still use the 2D Drafting, 3D Modeling, and Classic AutoCAD workspaces that come out of the box or any migrated workspaces that you may have. You are not forced to use the Initial Setup Workspace, but you may find that you like it. This step can be skipped with no harm done whatsoever. If you feel that you missed out by skipping the process, just go to the Options Manager, User Preference Tab, and click the Initial Setup button on the bottom left to start it again. If you used it once, you can use it again to create a second (or third) workspace. I recommend renaming your first Initial Workspace because when you create a second one, AutoCAD 2010 will use the name Initial Workspace 1, then 2, then 3, etc. I would name your workspace according to the Industry and any specific details you included while setting it up. But of course, feel free to name it whatever you want to. This tool can help you create new workspaces quickly that are industry, template, and tool pallet specific with little effort. Well, as you may have read I spent a few days in San Francisco last week. When I got there, I found a note in my bag from my daughter. 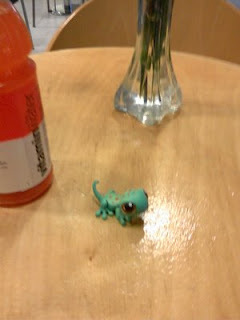 She added a little toy lizard, named Spot, and asked me to take pictures of him on "his" trip. So I did and here they are. 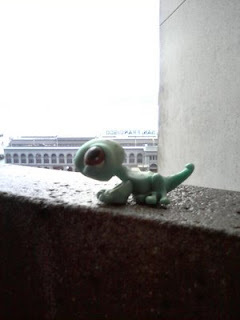 In his first picture shown, Spot is sitting on the ledge of the balcony from his room. This view is looking towards the bay at the ferry station in downtown San Francisco. Spot enjoyed his stay there and looks forward to going back. The next picture shows Spot looking out the window at the same view. 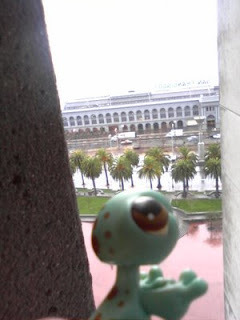 He enjoyed looking out at the city of San Francisco. 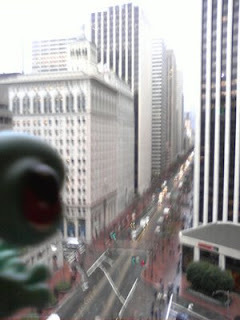 On the left, Spot is looking out yet another window at his hotel towards downtown San Fran. 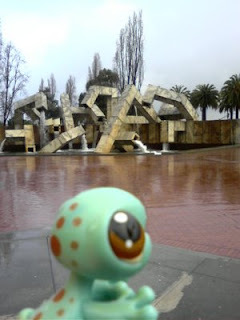 The picture he took is a little blurry, but in his defense, it was raining that day, as it was most days he was there. You can see the busy lifestyles that many San Franciscians (spell check doesn't know what to do with that word) live. 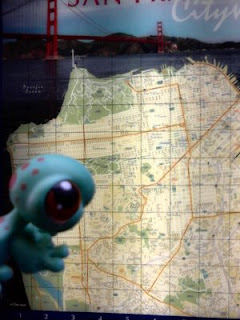 Spot comes from a little town, so he was fascinated by the "big city." But he loved it and wants to visit again. It was raining a lot on Spot's trip, but he braved some of the elements on his last day. He didn't know where he wanted to go so he checked out a local map. Should he go to the Golden Gate Bridge or visit "The Rock"? Before he set out on the town, Spot needed nourishment. He loved all of the local shops and restaurants. There were so many that he had difficulty choosing. He settled for a nice place that wasn't as busy as some of the others. He was not disappointed. There were so many things to see just outside the hotel. The city has several pieces of art on display for visitors to see and enjoy. This is but one of them. Spot hitched a ride with me on my visit to Autodesk's office in San Francisco. He met several other "lizard" folk and quickly made new friends. The picture on the left is Spot's new friend. He didn't get his/her name, but it is one of the exhibits on display in Autodesk's office. There are many, but Spot particularly enjoyed seeing this giant Lego block Dinosaur. It is a fine work of engineering and tons of fun to create. Spot made a second friend at the office. During our tour of the Autodesk Labs products, we met and made a new friend on their Touch Screen Display. We were able to interface with this fascinating technology using Autodesk Mudbox to manipulate a model of a lizard. Spot couldn't reach the screen to try it himself, but he cheered me on when I manipulated the model and when I changed it's colors, etc. Touch technology is fantastic and exciting. It holds a lot of potential for thhe design world. Well, the rain finally got to spot. He's a lizzard and prefers the dry heat, not the soggyness of a constant drizzle. In fact, for a minute, it strated to rain very hard and he needed to check his e-mail. He uses Mozilla by the way, evidently it's a lizzard thing. 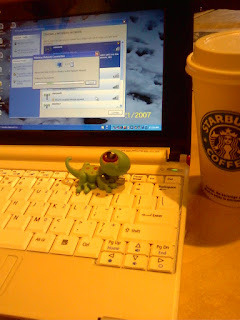 He also likes coffie, so we ducked into a local Starbucks for some shelter and a mocha. It wasn't hard to find a Starbucks because as Donnie gladfelter said "there's one at the top and bottom of every hill, and in the middle." We kept getting lost because of them. We thought we were walking in circles because every corner had a Starbucks. Spot thought he was walking in circles and kept seeing the same one over and over again, but he wasn't. One word of advise when visting San Francisco, don't use Starbucks as a landmark! Spot wants to thank you all ofr sharing his trip pictures with him. He had a great time and wants to visit again. Autodesk has finally announced their release of AutoCAD 2010. I have been fortunate enough to be a part of the Alpha and Beta teams testing it. I also created some new dynamic blocks, templates, and example files for AutoCAD 2010. Some of these will come with AutoCAD 2010, while the rest (the example files) will eventually be available to download from Autodesk’s website. I spent Thursday, February 5th at Autodesk’s office in San Francisco to be present at the live webcast! What a treat. I was able to meet several people from Autodesk as well as several of my fellow bloggers. It was very nice to finally meet these wonderful people, even though I have known many of them for a long time. I even got to work with several of the A’deskers while I was on the example files project. Autodesk understands the value of bloggers, their perspective, and passion. I know because they told us. They said we were special, just like my mom always said! Now that I am allowed to talk about AutoCAD 2010, I plan to! There are so many new features, enhancements, and improvements that I don’t know where to start. I feel that AutoCAD 2010 is one of the best releases yet. I will get into it soon. Autodesk also sat down with us to discuss many topics, what we liked, didn’t like, what needed more work, what was just right. They also gave us some insight into their philosophy in implementing AutoCAD, how they perceive its roll especially when compared to the many verticals that Autodesk produces. Over the next few days I plan on discussing all of these topics. I would have posted sooner but I didn’t bring my laptop into the event so that I could blog right from there. Well, I wasn’t the only “dork” amongst the bloggers, there were about one or two others that didn’t bring their computer either. But wow, what a great time we had. We were just a bunch of enthusiastic CAD users and bloggers from so many different industries and countries hanging out at Autodesk. What a total geek fest!! But we are the cool geeks if I say so myself. Some of the bloggers that were there are: Robin Capper, RK McSwain, Todd Shackelford (the original Lazy Drafter), David Cohn, Donnie Gladfelter, Melanie Perry, Ellen Finkelstein, Mark Douglas, and Steve Johnson. There were ten of us, not to mention some Autodesk bloggers that were there, Shaan Hurley, Lynn Allen, and Heidi Hewett. Besides the bloggers, we also met with Eric Stover the AutoCAD Product Line Manager. We also met with Kathy O’connell, Guilermo Melantoni, and Diane Li. These three individuals are the AutoCAD Product Managers and were very eager to hear our opinions both good and bad. They loved to hear the good things we had to say of course but were honestly more concerned with what we didn’t fully like. Imagine that, Autodesk wanting to make their product better!! I posted a few days ago asking if you thought Autodesk did a good job of listening to its users. Well, from my experience they are trying. They have over 9 million users and it is difficult to hear all of those voices. That is one reason they have turned to the bloggers. They know that each of us work with AutoCAD and its verticals every day. They know that we hear from our readers what issues you are having, so they are embracing this new “media” in an attempt to better their product. Good idea. I almost forgot, we also spoke with several of the programmers that actually wrote the code for AutoCAD 2010! Cool!! I totally geeked out. Some of the programmers we spoke with were Yan Schover, Mellissa Dawe, Shekahar Kledekar, Mat Stein (the Ribbon guy), and Jon Page. On top of that we also spoke and interviewed Abhijit Oak, Ravi K., and John Schmier. These gentlemen are on the product engineering team. We also met with John Schmier. John is the Sr. Engineer & Evangelist for Autodesk Labs. We had a tremendous amount of fun seeing and playing with all sorts of gizmos that Autodesk Labs is producing and studying. I am going to blog about the meetings we had, the topics we covered and what it all means for AutoCAD users. I will also start going over the many new features in AutoCAD 2010. I can’t wait; I have so much to share. I asked on a previous post if you thought Autodesk listened to its customers. I just spent a day at the Autodesk office in San Francisco taking with several people from Autodesk. I was also able to spend some time with fellow blogger Steve Johnson. He took the time to interview three key people at Autodesk. They were: Shaan Hurley, Eric Stover, and Jon Page. I wanted to make sure you had to opportunity to watch Steve's video interview. There are two of them and they provide a detailed response to this question. Thank you Steve for conducting these interviews and for providing us with this valuable info. Great job as always Steve. Autodesk has released several online resources for AutoCAD 2010. Now I know it doesn't release until March some time, but you can start learning about it and it's features. Autodesk has released a preview guide and some demo videos. There was also a live webcast on February 5th announcing its release. They archived that webcast for us to view. I hope you find these online videos useful. Before you know it, subscription members will start receiving their copies of AutoCAD 2010. I have written a review article for Cadalyst Magazine. This review article take a look at Graphtec's CSX300-09HDplus Wide-Format Scanner. This scanner is meant for firms that need full color scanning but do not have a hehavy load. This reduces the initial cost so that the company will have access to color scanning. It does a great job of scanning, it's just slow. The black and white scanning abilities are up to par and allows companys to archive paper drawings. Check out the full article at Cadalyst. I went to the Autodesk office in San Francisco on February 5th to take part in an even that revolved around the live web cast of Autodesk’s announcement of the release of the latest version of AutoCAD, AutoCAD 2010. Ten bloggers that were involved in beta testing AutoCAD 2010 were present. You may know some of them. If not, you should really put their RSS feeds in your reader. The bloggers were: Robin Capper, RK McSwain, Todd Shackelford, David Cohn, Donnie Gladfelter, Melanie Perry, Ellen Finkelstein, Mark Douglas, and Steve Johnson. All of these bloggers have been using AutoCAD and other Autodesk products for a very long time and are well versed in its use. We had a great time getting know each other face to face instead of through a message board. Many of us have met before at Autodesk University, while others (like myself) had never met anyone live in person. Let me tell you, no one looks like their avatars!! But some of us do have pictures of ourselves on our blogs, so I was able to recognize several of my fellow bloggers. Most of us arrived the day before and gathered together at a local watering hole. We introduced ourselves to each other and several Autodesk employees that were also there. I was able to speak with Eric Stover, the guy in charge of AutoCAD, and several other managers, directors and programmers. The next day was the event. We started off with an introduction and discussion of many of the new features and enhancements within AutoCAD 2010. They were very eager to hear what they got right. But they were equally, if not more, eager to hear what still needed work. I came from this event feeling that Autodesk really does care what its users want and need. They final made it so we could reference PDF’s as an underlay within AutoCAD. And, you can snap to it too! Later on we had the opportunity to sit with certain people from Autodesk and interview them. These interviews will be posted on Autodesk’s website. I will provide a link when they are available. I was able to speak with two members of the product engineering team in AutoCAD, Abhijit Oak and Ravi K. They were involved in laying down the main structure for the basis of many of the new features. AutoCAD 2010 has freeform modeling in it. It can use meshes, solids and surfaces. The modeling in AutoCAD 2010 is now organic! These two gentlemen told me that they used Maya to help lay down the code for AutoCAD. Users of Maya will find that the mesh work and gizmos in AutoCAD 2010 are similar in nature. They also helped to lay the foundation of the new Parametric and Geometric Constraints that are in AutoCAD 2010. They again went to an Autodesk product to develop these new tools; Inventor. Inventor users will find the constraints in AutoCAD very similar. In fact, Lynn Allen, AutoCAD and Inventor Evangelist for Autodesk, said that she even tried to perform an Inventor example of constraints in AutoCAD 2010 and was able to get quite far. AutoCAD constraints aren’t on the same level as Inventor, but they are very close and work in a similar fashion. These are the main new features in AutoCAD 2010, but there are several others that are far less flashy, but make the user’s experience much more efficient. Want to ask Autodesk a Question? My last post, Does Autodesk Listen to its Users?, asked you if you thought Autodesk listens to its users, as the title implies. If you haven't already, participate in the poll. Select the percentage that you feel Autodesk does listen at. I want to steal (I mean borrow) another idea from Steve Johnson and give you a chance to ask Autodesk a question. Keep it reasonable, and like Steve said, they won't be able to answer pricing questions. But what do you want to know? Release cycle issues, major bugs, what's in store for AutoCAD, Revit, Civil3D, etc. I am going to San Francisco in two days for a meeting with Autodesk. There will be many bloggers there, members of the press, and Autodesk officials. I will be able to speak with several officials, so if you have a simple enough question post it here as a comment and I will see what I can find out. I can not make any promises except that I will try. I know, there is no try, only do or do not, but I will see what I can do! Does Autodesk Listen to its Users? I just came across a great post from Steve Johnson discussing a trend that he has seen from AutoCAD users. His post discusses and asks why so many users feel that Autodesk isn't listening to them. Do you have feelings like this? Do you think they do listen? Are they just a giant company with no ears? Or do you feel they go out of the way to try and create a product its users are demanding to have? I've created a poll to help us get an idea of what you think, but polls are difficult to express your opinions in. Soooooo post a comment, tell us what you think. It is my personal preference not to customize AutoCAD too much. I feel that it can cause too many problems later on. The first is when you go and work somewhere else. Nothing is where or how it should be, and when you update your system it can be a huge pain. Fortunately these two factors are rare, so maybe I don’t have a valid issue here. Ok I don’t, but when they happen they are a pain. My biggest argument against customizing AutoCAD comes from a CAD Managers perspective. It is a night mare for CAD Managers to maintain everyone’s workstations if they have customized it. I think that is my real issue. I speak from my own personal experience that having to fix problems caused by users customizing their workspace. If everyone has a different workspace it also becomes more difficult to train, maintain, update and standardize. Regardless of my own personal fears of maintaining different customized workstations, the ability to customize AutoCAD is fantastic feature! What? I know what you are thinking, “Didn’t you start this post by ranting about not customizing?” Yes I did, but nobody listens to me anyway! My train of thought is to go ahead and customize AutoCAD, but be limited in those customizations. There is a time and a place for each application of customization. Don’t do it just because you can. Do you really need it? Will it really increase your efficiency? Will it slow you down when you update? Migrate? Or take on other tasks? What if your computer crashes? Can you easily restore your settings? Maintaining AutoCAD’s settings can be a full time job all in itself. Make sure to keep it organized in a simple manner so that you can easily add on to your customizations and update with little effort. I feel tool pallets are under rated by many users. I feel (did you notice that I am talking about my feelings a lot today?) that tool pallets are often underrated by many users because they simply aren’t used to using them yet even though they have been around since AutoCAD 2004. They really took shape in AutoCAD 2005 though. Many are still used to adding things in the pull down menu. I recommend staying away from the pulldown menu. I remember when I was customizing commands in the Menu Screen. I’m glad I stopped that practice! If you work with standard blocks, hatch patterns, or template files, try using tool pallets. They are very easily maintained and migrated. Set up a master block file that contains your blocks to be shared with your users. Update/maintain the block in the file; make a tool pallet referencing that block; then you only have to update the block to make sure every user has the latest block. You don’t even have to tell them, unless they need to update that block in a current file. Toolbars are going the way of the dodo. In AutoCAD 2009 the interface was changed to a Ribbon style. Toolbars and the menubar are turned off OOTB (out of the box.) They can be turned back one though. I recommend sticking with the ribbon so that you can become more accustomed to its style of interface. However, I like toolbars. They are small, easily placed on the workspace, and easily customizable. I would recommend using them. You can use the Ribbon like toolbars, but I’ll get into that later. Toolbars can be created in the CUI and transferred easily enough through a migration. They can also be set up easily enough. The best part about them is that you can create one (or two, or three) and place them at a good spot on your screen. They are always there and don’t move. One Problem I have with the ribbon is that you have to click a tab to get to a panel to get to a command. With toolbars, you just move to it and click. That being said, you can pull out Ribbon Panels and use them like toolbars, so really you don’t need toolbars anymore, just the ribbon. I have two recommendations for using the ribbon; pick the one that best suits your needs. My first recommendation (not in any particular order) is to create a custom TAB that has all of the commands you use every day. If you use it every day put it there. The HOME tab is meant to serve this purpose but it might not fit your exact needs. That’s ok. If you only need to add a few commands, then add them. Don’t bother making a new panel. The Quick Access Toolbar is also a great spot for everyday commands, though I would be careful not to make it too bulky. My second recommendation is to collapse the Ribbon to its smallest size and pull out the panels containing the commands you need most as if they were toolbars. Customize them if you want or need to, but again keep all of the customization to a minimum. A hybrid customization of these two methods may even be appropriate. Make a Ribbon TAB that has your commands in it and pull them out. This will make maintenance easier. You only have to go to one TAB to update. You won’t have to go from tab to tab to panel to panel to try and find each command that needs changing. Keep your custom panel in one place, that way you only have to search in one place. The ability to customize AutoCAD can be very complicated, but highly beneficial. Do so with care and with the future in mind. Adding a little custom tool here and adding one there will eventually create a giant sized custom interface that can be difficult to maintain. Keep it simple and you will find that you are working at your best.